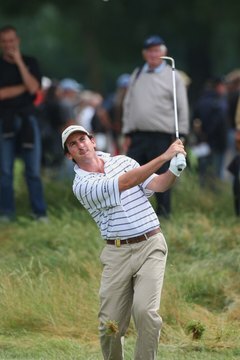 When a pro like Gonzalo Fernandez-Castano hits a high pitch shot, the ball stops quickly because it comes almost straight down. If you ask a dozen different golf instructors how to hit a pitch that hops once and stops, you might get a dozen different answers. There are many ways to get that ball to stop. However, a few basic principles are common to all those methods, and they aren't hard to learn. Once you get a handle on them, you'll be able to stick your pitch shots from almost any decent lie. Assess your lie. This is the most critical step. To stop the ball quickly, you must either put a lot of backspin on the shot or hit it very high and soft. The lie will dictate what you can do. From a tight lie such as hardpan, or if you need to keep the ball under some low branches, you'll probably have to hit a low spinning shot. From a fluffy lie in the rough you'll have to try hitting the ball high. And from a good lie in the fairway you may have a choice. Some lies are so bad that you can't stop the ball quickly no matter what you do, but if you understand your lie you can at least minimize the roll. Determine where you intend to land the ball. Obviously it's easier to stop a ball when you're pitching it uphill than when the ball will land on a downhill slope. You can probably stop a pitch to an uphill green with any option, but a pitch to a downhill green almost always requires a high soft shot. Just remember that the downhill pitch will still roll some no matter what you do. Address the ball in the proper position. The key here is making solid contact with the ball. Your address position will generally be the same on all pitches — a slightly open stance with your weight set slightly on your front foot. You'll also want to stand a bit closer to the ball, as this makes it easier to make a clean downward hit on it, which creates more backspin. However, for a low spinning pitch the ball needs to be back in your stance; that way your hands will be in front of the ball to help "pinch" it against the ground and impart spin. For a higher shot the ball should be more forward in your stance so you can create more upward than forward momentum. A good rule of thumb: Imagine a line dropping straight down from your hands to the ground. For a low pitch, ensure the ball is an inch or two behind that spot; for a high pitch, it should be an inch ahead. Set the club face properly. If you placed the ball back in your stance for a low pitch, you want the club face squared to your target line. If you plan to hit a high pitch and the ball is forward, open the club face a little. Make good contact. If the ball is back in your stance, be sure to hit the ball first. If the ball is forward in your stance, try to hit the ball and the ground at the same time.